A pink manganese carbonate mineral used as an ore, a gemstone, and a crystal specimen. 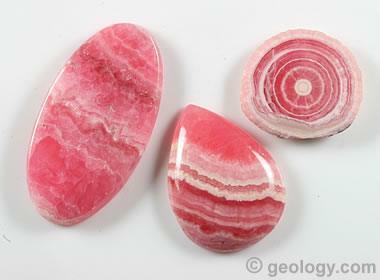 Rhodochrosite: Rhodochrosite cabochons illustrating the banded pink colors that are characteristic of this mineral. The specimen in the upper right is a slice from a stalactite. All stones cut from material mined in Argentina. Rhodochrosite is a manganese carbonate mineral that ranges in color from light pink to bright red. 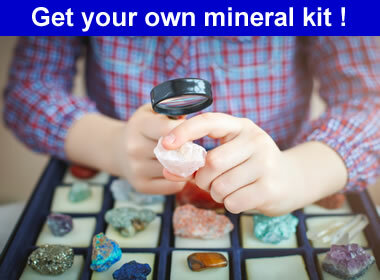 It is found in a small number of locations worldwide where other manganese minerals are usually present. Rhodochrosite is sometimes used as an ore of manganese but is rarely found in economic quantities. Specimens with a wonderful pink color are used to produce highly desirable gemstones. Rhodochrosite is rarely found as well-formed crystals, so crystals can be extremely valuable as mineral specimens. Rhodochrosite has a variable chemical composition. It is a manganese carbonate, but the manganese is frequently replaced by iron, magnesium and/or calcium as shown in this formula: (Mn,Fe,Mg,Ca)CO3. These substitutions of other elements for manganese change the composition and alter the specific gravity, hardness, and color of the mineral. The bright pink color can become grayish, yellowish, or brownish in response to this chemical variability. A complete solid solution series exists between rhodochrosite and siderite (FeCO3). Rhodochrosite is generally easy to identify and is rarely confused with other minerals. Its pink color, perfect cleavage in three directions, low hardness, and weak effervescence with cold dilute hydrochloric acid are rarely seen in other minerals. The most common confusion is between the names "rhodochrosite" and "rhodonite" -- both are pink, manganese-rich minerals with very similar names that people have a hard time remembering. Colorado Rhodochrosite: Rhodochrosite is the official state mineral of Colorado. Sometimes, nice transparent specimens can be found that are suitable for cutting faceted stones. This faceted cushion was cut from material obtained from the famous Sweet Home Mine near Alma, Colorado. It has a nice orangish pink color, measures 6.7 x 6.2 millimeters and weighs 1.52 carats. Photo by Bradley Payne, TheGemTrader.com. The formation of rhodochrosite usually occurs in fractures and cavities of metamorphic and sedimentary rocks. It is often associated with silver deposits, and a few silver mines produce rhodochrosite as a byproduct. Some of the common modes of occurrence and their lapidary uses are described below. In metamorphic rocks, rhodochrosite is found as a vein and fracture-filling mineral where it precipitates from ascending hydrothermal solutions. Repeated episodes of crystallization allow it to build up in layers on the walls of the fracture. Each layer can be a unique precipitation event and produce material with a slightly different pink color. This gives character to the material for lapidary use. Miners usually remove the rhodochrosite from the wall rock of these veins and cut it into thin slabs with a diamond saw. The slabs can then be used to make cabochons, small boxes, or other lapidary projects. Some rhodochrosite forms in cavities in sedimentary and metamorphic rocks when descending solutions deliver a supply of dissolved materials. In these deposits, the rhodochrosite accumulates in layers on the walls of the cavity and may form stalactites and stalagmites on the roof and floor of the cavity - just like speleothems in a cavern. These formations are often removed and slabbed to produce material with concentric pink banding. Some of the best examples of this form of rhodochrosite are found at the Capillitas and Catamarca deposits in Argentina. Rhodochrosite is extremely rare as well-formed crystals. One of the few locations in the world where they are found is the Sweet Home Mine, near Alma, Colorado. Originally opened as a silver mine in 1873, the rhodochrosite was disregarded at that time. Then, as the popularity of mineral collecting increased, the well-formed crystals found at the Sweet Home Mine became many times more valuable than the lapidary material. Excellent, small, hand-size specimens currently sell for five-digit numbers. Broken or damaged crystals are sometimes used as faceting rough. Rhodochrosite for lapidary and mineral specimen use is only found in a few locations worldwide. These include Argentina, South Africa, Peru, Montana, Colorado, Russia, Romania, Gabon, Mexico, and Japan. Superb Rhodochrosite Crystals: Crystals of transparent red rhodochrosite on tetrahedrite with a few clear quartz crystals. This specimen is about 5 x 4 x 2 centimeters in size and was taken from the Sweet Home Mine. Crystals this transparent and of such wonderful color would make beautiful faceted stones, but because this is such a fine crystal specimen, there would be a huge financial loss if that were done. Specimen and photo by Arkenstone / www.iRocks.com. Rhodochrosite is a favorite gemstone of many people. It is often slabbed to show off its banded or concentric patterns. Most of the slabs are used to cut cabochons. Cutting rhodochrosite is a difficult job because the material has perfect cleavage, and it is so soft that it is hard to polish. Nice, stable, slabbed material is sometimes used to make small boxes and other ornaments. The rare transparent material that is not suitable as a mineral specimen is sometimes faceted into attractive pink and red gems. The beautiful stones produced are mainly for collectors because faceted rhodochrosite is too fragile for most jewelry use. Rhodochrosite has a hardness of only 3.5 to 4 and has perfect cleavage in three directions. This eliminates it as a good choice as a ring or bracelet stone which might be subject to abrasion or impact. It does well in earrings, pins, and pendants, which are generally not subject to as much abuse as a ring.